and it serves as an inside look at their design process. 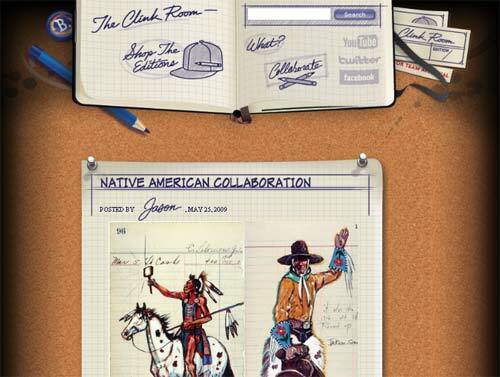 They specialize in designing logos, characters, and mascots for minor league and major league baseball teams. You have probably seen their work, whether you realize it or not. Now you can check out how it arrived at the end result. , we have a winner….and it probably isn’t what you expected. 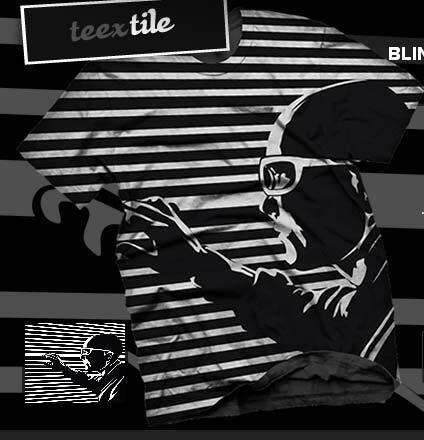 The design is impeccable and the print should be amazing. The only problem is, this one might leave you scratching your head. 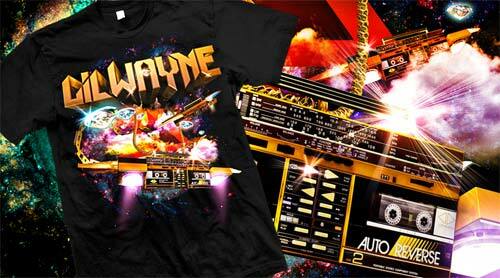 You just have to keep in mind the future of Lil’ Wayne and not his past to understand why this design is so relevant. You see, Weazy is about to embark on his “rock n’ rap” career. Knowing that makes this design hit the nail on the head. 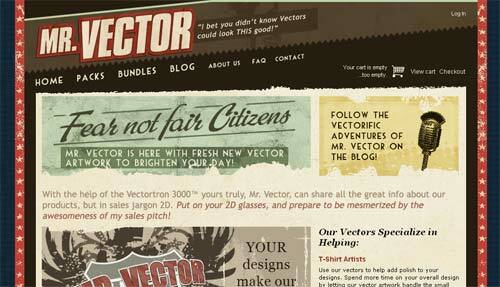 , a very prominent design blog, put together a pretty good list of t-shirt designs they found. It was cool to look and realize that the T Addict hadn’t seen many of these before. Some are great designs, some are clever and some conceptual. Either way, they don’t disappoint. It’s a solid list that’s worth a look. 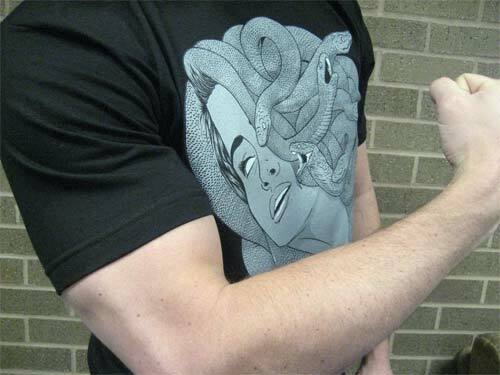 and some of their newest t-shirts are unreal. And by unreal, I mean some of the realest shirts I’ve seen in a while. I haven’t posted about these guys yet because they are fairly new and needed some time to prove themselves. It looks like the proof is in the pudding. “Don’t look too closely at this shirt, or you might turn to stone.” By the looks of it, you might think that the T Addict has already turned to stone with those rocks for arms. Ha! I kid, I kid. 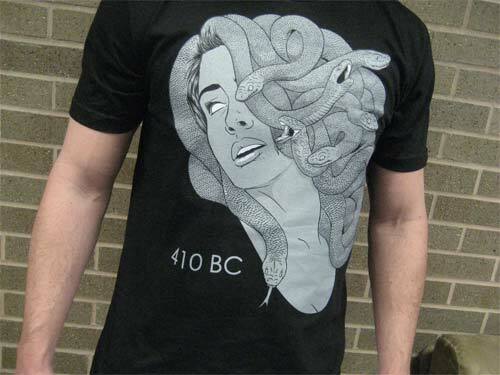 But seriously though, the Medusa is one cool shirt sent to me by 410 B.C. 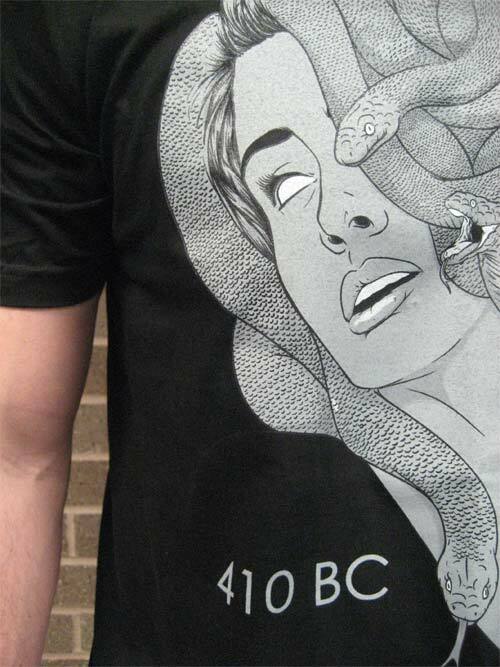 If you haven’t heard of the brand 410 B.C., then you might just be a caveman/woman yourself. These guys burst onto the scene in 2008 and haven’t stopped running since. Their look is fresh, mixed in with a little punk. They also do a great job of being connected with their fan base by running a tight little blog and having outposts on all the big social sites.
. The shirt is slick! 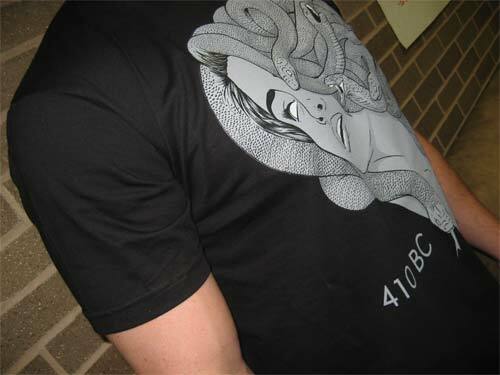 It comes in my favorite color tee, black, and has appropriately subdued printing colors with shades of gray. 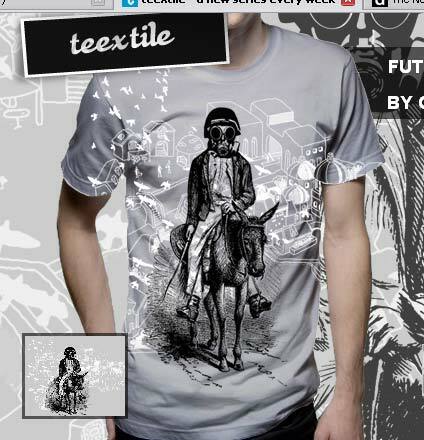 by The Art of Apparel. 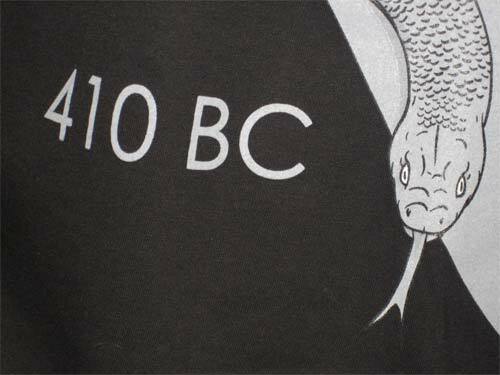 You know I had to flex or you wouldn’t have known how well the shirt fit. .
410 B.C. has a lot of good things going for them. 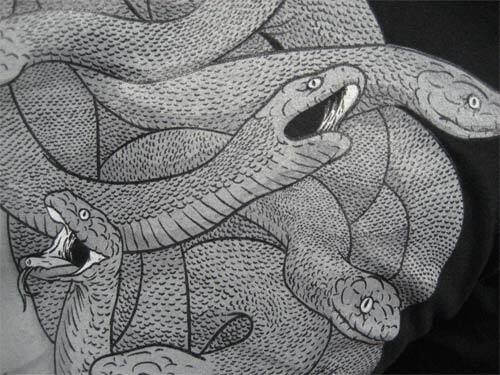 They’ll definitely stay on our radar because they are continually putting out new gear and hustlin’ all over the web. and it’s a high quality, royalty-free vector artwork packs. 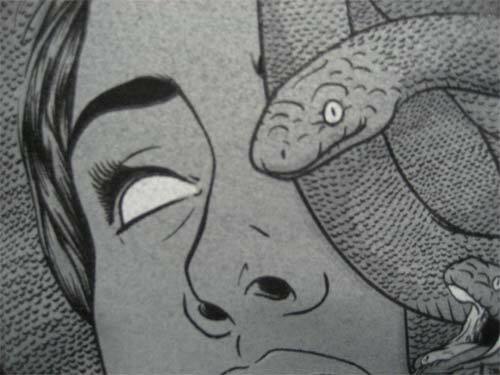 A quick once over of the offerings and the T Addict is blown away by the low prices and crazy good artwork. Congratulations Liz, we hope they sell like hotcakes!